Thor – known as the great champion of the Gods with strength that is believed to have come from his holliness encounters many a challenge. Although he portrays aggression, this is not unfounded or without provication as his challenges are normally provoked through ill-willed beings. Thors role is to at all times maintain order and be a protector to the Gods, humans, alfs and the Earth itself thus eliminating destruction of any description. 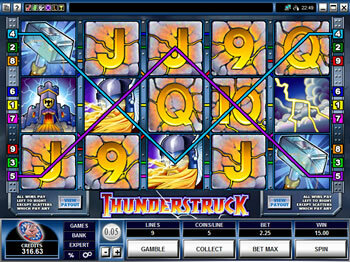 Thunderstruck is a five reel, nine payline, and forty-five coin slot machine. It has a scatter and a wild, multiplier symbol.Thunderstruck has two Bonus Features. These are Free Spins and Gamble.The Thor symbol is a wild, multiplier symbol. This means that it substitutes for any other symbol to complete winning combinations, except the Rams symbol. The Thor symbol doubles the payout of any combination it completes.Multiple Thor symbols on an enabled payline create Thor winning combinations. Thor winning combination payouts are not doubled. The Thor symbol only multiplies payouts if it acts as a wild symbol.The Rams symbol is a scatter symbol. This means that it does not need to appear in a line on an enabled payline to win. It can be scattered anywhere on the five reels, provided two or more Rams symbols appear. Maximum Jackpot – 10 000 coins x 5 coins per line = 50 000 coins in base game. 10 000 coins x 5 coins per line x 3 (Multiplier) = 150 000 coins in Free Spins Game. What are the Thunderstruck Slot Paylines?